I've been meaning to try out Le Papillon after the endorsements of the restaurant and Chef Anderson Ho by Chubby Hubby and Pineapple Malibu, but didn't quite find the time. Thankfully I get two hour lunches, so I was able to have lunch there with my father earlier this week. The Red Dot Traffic Building is one of those incongruous places you wouldn't expect to find a restaurant. 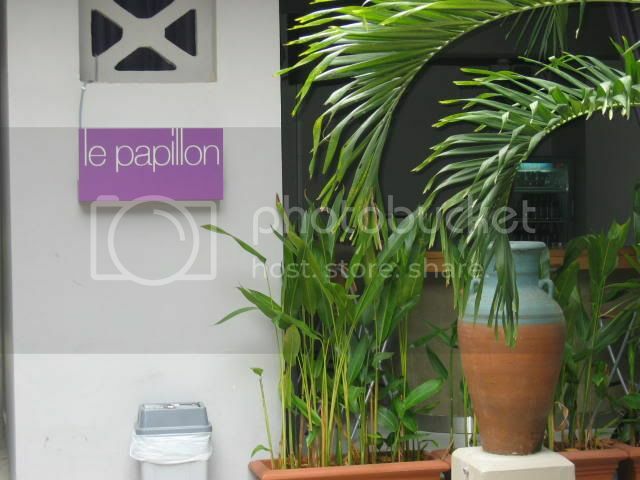 A rather drab concrete courtyard affair houses a few eateries, of which Le Papillon is rather innocuously tucked away. Le Papillon is decently-sized, probably able to accomodate about 50 people. 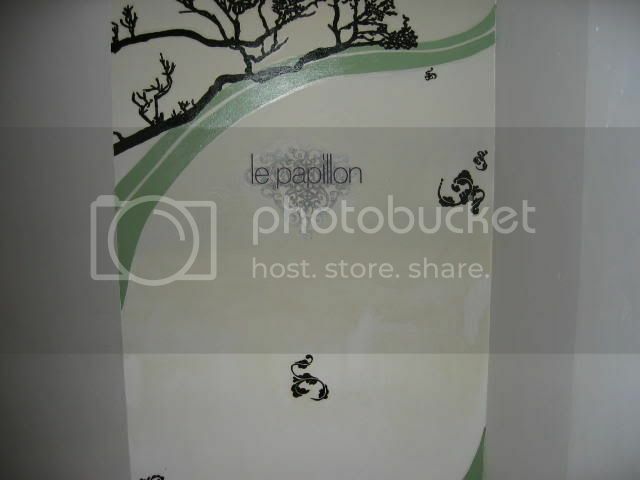 I really like their clean, white lines, embellished by artful wall prints. Understated and in keeping with the modern European fare you expect from Chef Anderson. I had some concerns about service, seeing only two waitstaff and two managers, but this proved to be a non-issue. Manager Kelvin, in fact, provided exemplary service, seeing to all our requests and queries professionally and confidently. Good service really isn't that difficult to accomplish if one tries. The menu for lunch is rather limited; mainly a $28 set lunch of three courses and coffee. A la carte orders are possible but discouraged, allowing the chef to retain firm control of his ingredients and cooking. I looked through the dinner menu, and the $60 and $80 set dinners looked very inviting, but not so the a la carte orders, which I thought were rather pricey in some instances. I decided to have the pumpkin soup with marjoram oil, braised beef heel with root vegetables and potato chips, and the standard dessert of banana chocolate tart with chocolate sauce and vanilla ice cream. 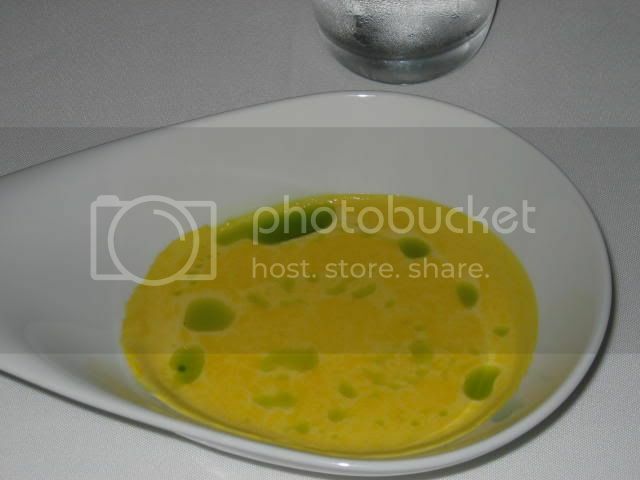 The pumpkin soup was sweet, but very creamy and had a slightly powdery texture. There was also some coagulation, which could have been because the soup wasn't entirely hot enough. The braised beef was very tasty, meltingly gelatinous, but I was slightly disappointed with the rather petite portion. The root vegetables turned out to be an assortment of diced onions, carrots and potatoes. Serving this with potato chips (crisps) seemed a strange combination to me, as the crisps inevitably soaked up the sauce and became limp. Dessert was a huge let-down; I am rather partial to tight-run operations like Au Petit Salut being able to serve a wide range of fairly sophisticated desserts like souffles and cakes during the busy lunch hour, and I expected something special in return for not being able to choose a dessert. 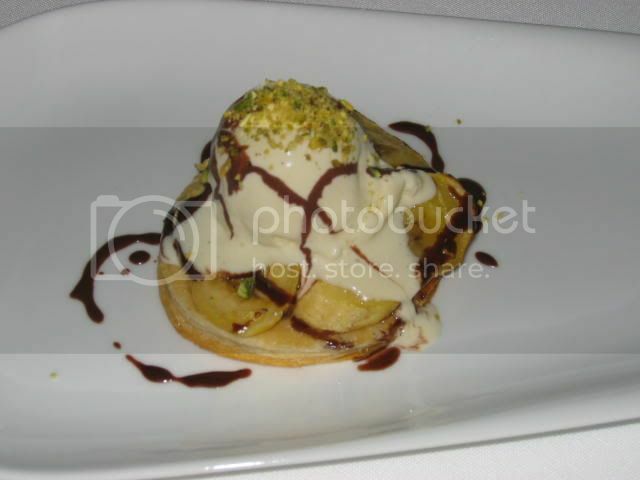 Instead, the few slices of caramelised banana on thin puff pastry topped with ice cream seemed to me both cheap and a bit of a cop-out. Overall, Le Papillon at lunch isn't particularly impressive, especially at $28, but I am still quite eager to try out the dinner offerings, which look much more attractive and about which I have heard some very promising accolades. Located in the heart of the CBD is a bit of a hassle, but I suppose access via the MRT provides some exercise before and after dinner. There is a public carpark just next door though, so parking is no problem. The buzzing of lunchtime conversation is unintrusive, rarely rising above the clinking of cutlery, and food arrives at an acceptable pace. 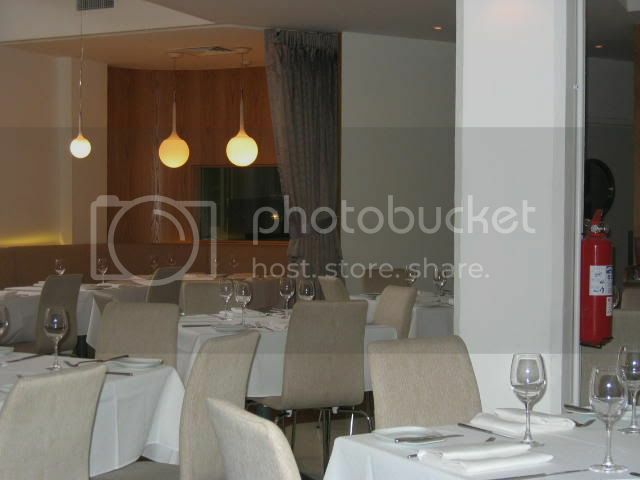 [Edit: I came back for lunch on 28/12/06, and the set lunch is now $29. I had a chestnut soup with parmesan foam, a grilled millefeuille of beef and the obligatory strawberry shortcake for dessert. The soup was fantastic; texturally smooth and light, with a delectable roasted sweetness from the chestnuts, and a slight saltiness imparted by the parmesan. 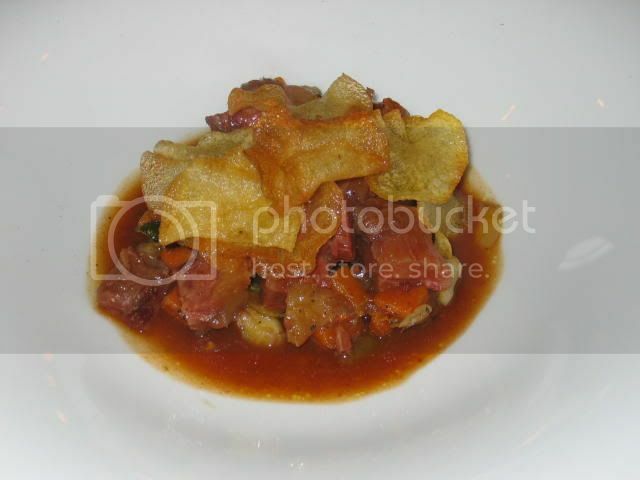 I was also surprised by the millefeuille of beef, which was extremely tasty and served with tender braised carrots and potatoes. 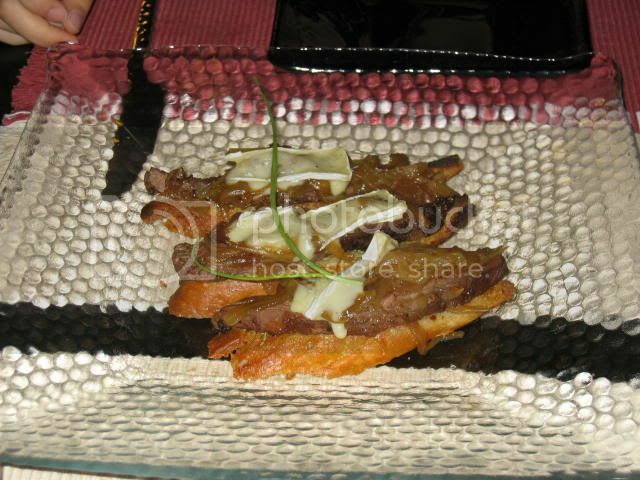 It was a "millefeuille" because the beef had been cut in such a way as to appear layered, yet it was still juicy and meaty. Unfortunately, I was still let down by dessert, which was just a small shortcake, topped with strawberry coulis, some dots of white chocolate ganache and a quenelle of whipped cream. In terms of food, Chef Anderson has clearly smoothened out some of the earlier kinks; the appetisers and main courses are beautifully presented and perfectly cooked, arriving in just the right portions for a light lunch. The only thing that needs to be improved upon is dessert, which regrettably isn't as impressive as the earlier courses. Once that gets sorted, Le Papillon will definitely be one of the more popular restaurants to eat at. Service gets bumped up to 4.5/5, Chef Anderson was good enough to spend fifteen minutes chatting with us, and accepted all feedback (both positive and otherwise) with good grace and openness. I quite like discovering offbeat eating places that are somewhat removed from the usual offering of Italian, French and Chinese fine dining. Consequently, a restaurant/bar named "Giraffe" serving unclassifiable cuisine (filed under "Chill Out" for convenience, since a bar isn't really "Casual") surely merits a visit, on the basis of the imaginative name alone. 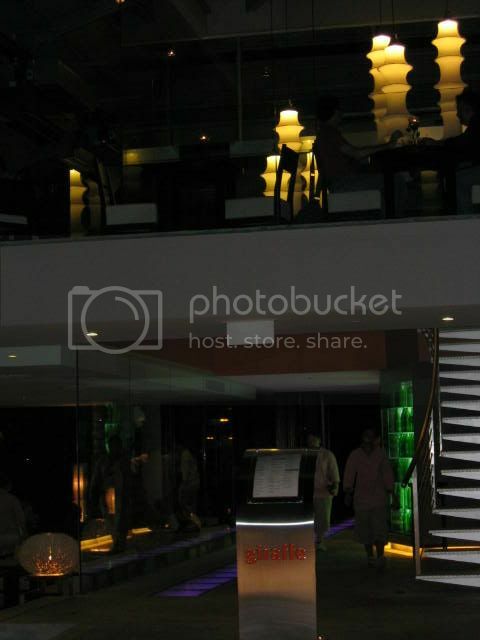 Giraffe is certainly an attractive-looking place, with its two-storey facade illuminating the otherwise dark Istana Park. 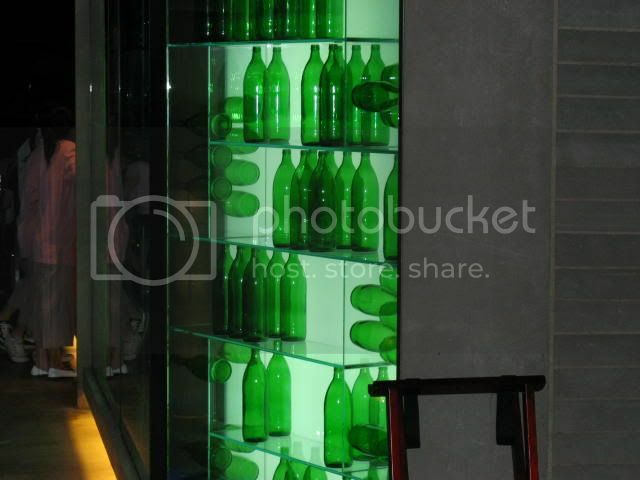 The restaurant makes very effective use of lighting to add ambience, the luminous green bottles that greet your entry are certainly eye-catching. Both indoor and outdoor seating are provided; organised around a central stairway lit by a collection of hanging lights, sitting indoors affords you the comfort of air-conditioning. However, for some unknown reason, all the air-conditioning vents have been directed downwards, and all air-conditioning units have a table situated directly beneath them. This results in a very cold dining experience should you linger over your meal. Outdoor seating provides you aerial views of Istana Park and the Istana itself, as well as the bustle of Orchard Road nightlife, and can be pleasant on a cool night. I'd heard the food was not as great as the ambience, and certainly the prices are comparable to most new-generation "laid-back eateries" like Blood Cafe or Marmalade Pantry. A particular sticking point is that Giraffe is one of those benighted places that doesn't serve water. Drinks range from $4 - $8, depending on what you opt for. A roast beef and camembert crostini ($13) served with caramelised onions was actually quite nice, the beef juicy and paired well with the sweet onions. The crostini could have been thinner, which is particularly important to all appetisers of this nature, as a thick slice of toasted bread is difficult (and painful) to bite into. 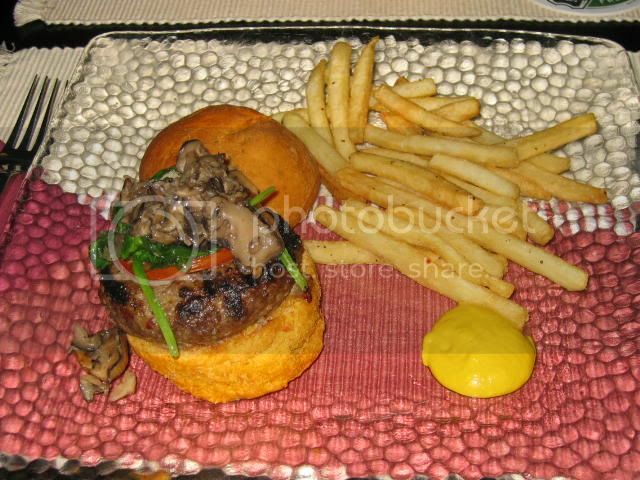 The beef burger ($16.90) was a thick beef patty served with a mound of mushrooms and vegetables, sandwiched by a toasted foccacia bun. While the patty was very tasty and juicy, a few things made the burger rather challenging to eat. First, the patty didn't hold together well, causing bits of minced beef to fall off along the way. Second, the whole burger was rather squat, and the thick, toasted bun couldn't be compressed into bite-manageable size. Still, I enjoyed it, though not the accompanying fries, which were soft, limp and starchy. The strong air-conditioning became a problem here, causing my meal to cool at a rapid rate. After dinner we adjourned to the bar for drinks. 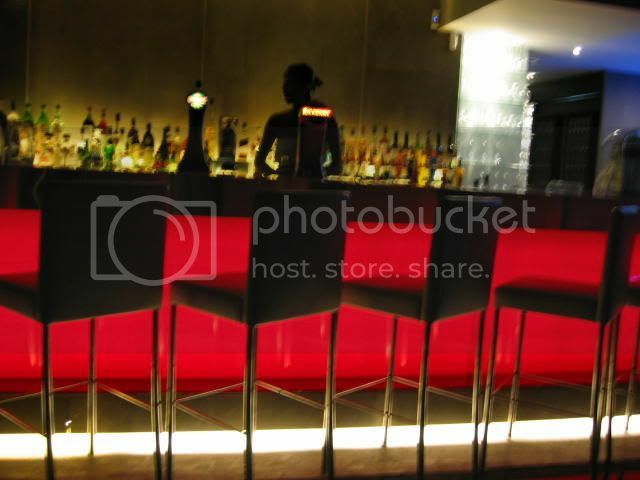 Again, the bar area employs some funky light features, with the glowing red lighting creating a suitably understated ambience for enjoying drinks. The bar overlooks a body of water directly opposite the Istana, and is evidently a romantic pit-stop, judging from the couples enjoying each other's company. In fact the whole restaurant and bar make a good date joint, a little island of greenery and peaceful solitude amidst the bright lights and thrum of the city. I'm not much of a drinks connoisseur, but I didn't really enjoy my Blue Hawaiian, which tasted a little too strongly of Malibu for my liking. Drinks go from $12 - $20, but they give you fairly generously-sized cocktails. Giraffe is located opposite the Istana, smack in the middle of the ERP, which makes it convenient to get to via MRT, but a hassle to drive to. Service is generally adequate, except for the bar area where it took us ages to order two drinks, but charging for water counts against them. Ambience is fine, but they should really do something about that air-conditioning. There used to be a time, when "chocolate cake" in Singapore invariably meant Lana Chocolate Cake. Since then though, this venerable establishment has been challenged by more recent upstarts. Foremost among these is Awfully Chocolate. I must admit, the first time I heard the name, I was somewhat skeptical. Purchasing cakes from a place called Awfully Chocolate was like buying wine from Sour Grapes. Plus the owner of Awfully Chocolate was one of the early lawyers who gave up the practice to venture into the F & B business, not exactly the best cake-making credentials. Additionally, every outlet has no display case, so you'd never know you were in a cake shop if you just happened to walk in. But when I took the first bite of an Awfully Chocolate cake, I had to eat my words (as well as the cake). It was amazingly rich, and unlike a Lana cake, very moist. The fudge was wet and creamy, with the sponge dense yet neither dry nor stodgy. Awfully Chocolate only sells chocolate cakes (what a surprise), but of three different sorts. They have a pure chocolate variety, unadulterated in any form, composed of chocolate sponge and chocolate fudge. Then there is chocolate and banana, which I've never tried, and finally chocolate rum and cherry, which incorporates rum-soaked cherries, adding to the moistness and flavour of the cake. Since I work about ten minutes away, I decided to pop by their Republic Plaza outlet, and discovered that Awfully Chocolate also retails ice cream (chocolate, of course) for $3 a scoop. 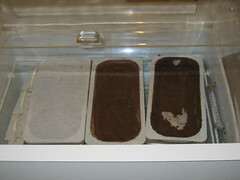 Like their cakes, the ice cream is very rich and intensely chocolate. It's not particularly creamy or sweet, in fact the ice cream is quite thick and stiff, which I think complements the chocolate very nicely. The outlet at Republic Plaza also provides chairs for you to chill-out with a friend over some ice-cream. Probably the best reason to buy your cakes at Awfully Chocolate (the one at Republic Plaza, anyway), is the friendly and helpful staff the shop employs. Leanne and Alex are always on hand, ready to answer any questions you might have with chirpiness and enthusiasm. Ask them about the ice cream muscle. The cakes go for $21-$26 per half kg, but if you're thinking of buying anything larger than that, be sure to order in advance, because they only stock the smallest cakes on site. While this is a little pricey, it's well-worth the money and calories for an occasional birthday treat. When I visited Korea three years ago, my cousins and I came across a "game cafe", a place where people (teens and young adults, mostly) could hang out over a cup of coffee, a simple meal and a game. An astonishing array of games, from Monopoly to Risk to Jenga to ones I'd never seen or heard before, as well as sections for video games and live soccer matches meant that one could effectively while away hours in the company of friends and pseudo-intellectual pursuits. My cousin was so intrigued by the idea that he almost considered starting one in Singapore, only to discover that Settlers' Cafe had beat him to it. Still, the memory stuck, and when I came across Pitstop Cafe, I felt obliged to drop in to take a look. I learned that the cafe had been previously plugged (enthusiastically) by Cowboy Caleb, so I can't imagine why it's taken me so long to take a look. I'm not sure if it is the lingering memory of my Korea trip, hostess Evelyn's delightful friendliness, an inate attraction to offbeat eateries, a deep respect for student entrepreneurs, a sympathy towards fellow bloggers, or all of the above, but I decided to offer to plug them on this blog. The Pitstop Crew (as the management call themselves) were kind enough to respond with some information about this quirky but cosy cafe. But first, my own thoughts. Located in Circular Road, above an eatery specialising in char siew, you'll definitely miss the cafe if you weren't looking out for it or had already heard about it. Location is a big problem, as I imagine their target customers (students and young 'uns) rarely venture into the CBD for meals. Very wisely, the Pitstop Cafe usually only opens for dinner, though lunches are served Friday through Sunday. I didn't have a chance to try out the food or coffee, or try out the games, but photos of the food and people enjoying themselves certainly appeared convincing. The accounts of the staff attending barrista courses and a detailed blog post about coffee certainly is persuasive too. Prices seem fairly reasonable. 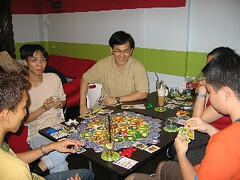 "Pitstop Cafe offers a cosy and homely ambience in which friends can gather together to enjoy the fun of playing boardgames. It offers a wide selection of games, great food, gourmet coffee and premium ice creams. 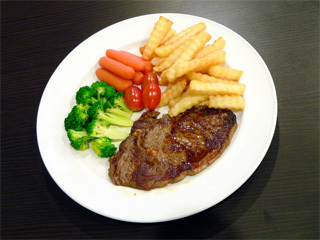 The cafe offers value of money meals like fish and chips, chicken chops and steaks starting from $6.90. There are also set meal and a selection of game packages available. The sweet desire package for example comes with triple scoop sundae from new zealand natural, a soft drink and 2 hours of gaming at only $10 per pax. The cafe is set up by a group of friends consisting of both graduates and undergraduates, with the hope of doing and trying out to run a business together. 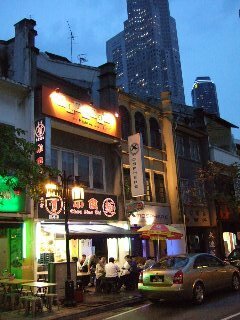 We are located at 14B Circular Road Singapore 043970 and can be contacted at 65355383. You can check our blog for more details http://pitstopcafe.blogspot.com"
So, if you're ever in the area, or if you're looking for something different during a night out with friends, drop by the Cafe for an affordable and enjoyable evening! 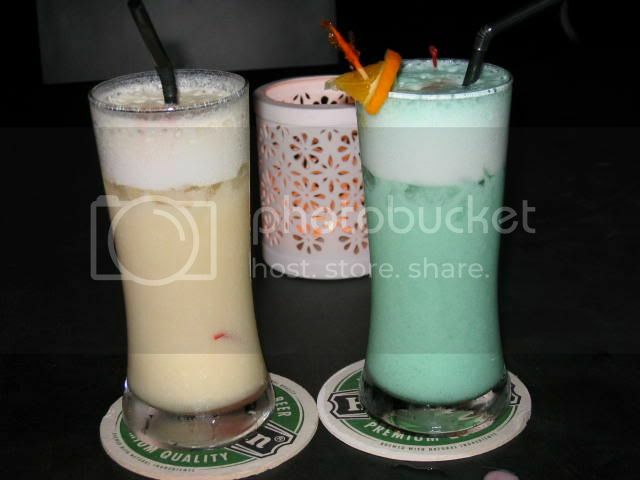 Disclaimer: All photos provided by Pitstop Cafe. 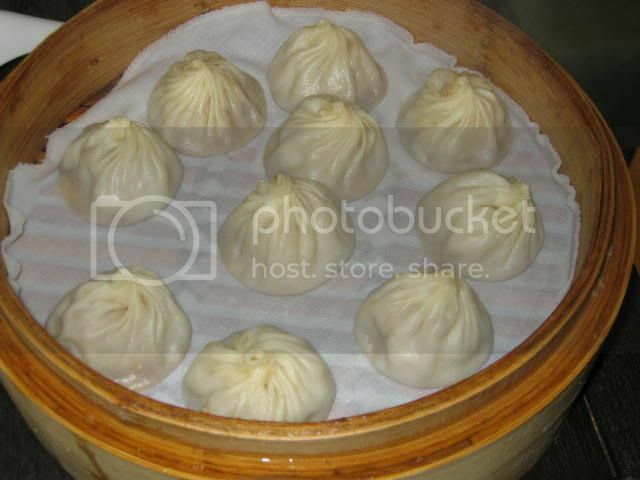 Hot on the heels of one xiao long bao place comes a review of another one. In the small, secretive and ruthless world of budget xiao long baos in Singapore, Din Tai Fung and Crystal Jade are locked in eternal combat, rather like McDonalds and Burger King, or Coffee Bean and Starbucks. Going to either and not ordering some xiao long baos is like a two-headed hippopotamus: unheard of. Din Tai Fung started in Taiwan, but like many successful Chinese restaurants, now has a number of outlets throughout Asia, especially in Singapore. 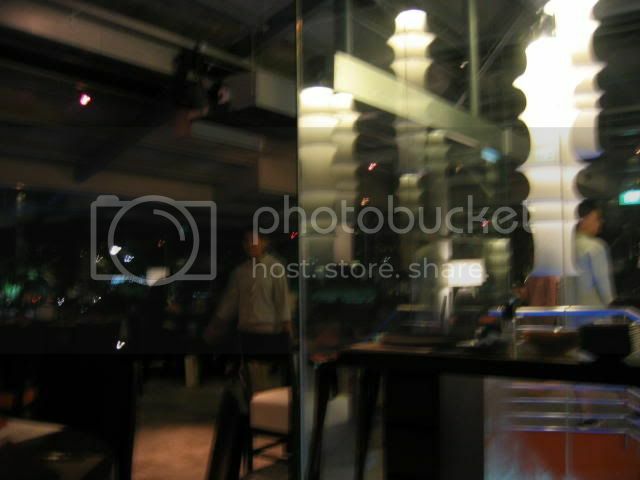 Recently, their latest one was opened at Wisma Atria, so Michele and I decided we'd give it a look-see. The restaurant is always crowded, as you can plainly see, but the Taiwanese, being very efficient, brilliantly give their customers queue numbers and encourage them to pre-order their food. I'm not sure if they accept reservations, but given the high volume of traffic through the restaurant, I would doubt it. If I recall, all Din Tai Fung outlets practice an open kitchen concept, allowing you to watch the army of artisanal chefs at work steaming dumplings and stretching noodles. Apparently, a hallmark of this Taiwanese chain is that all their xiao long baos are made with 18 folds in their skin, but I neglected to count them. 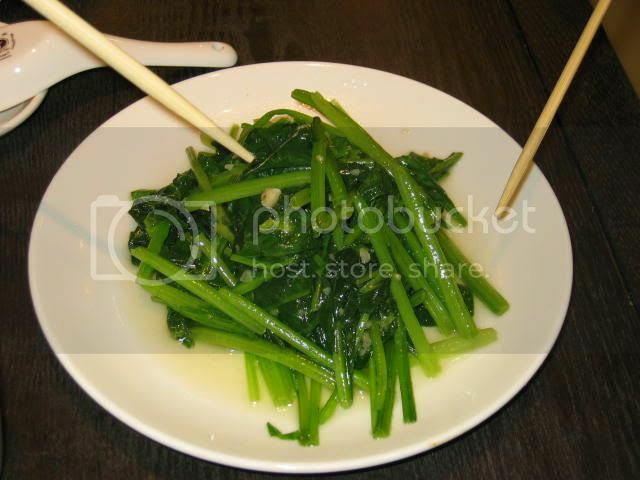 As we're both very healthy people, we had an order of stir-fried spinach with garlic ($8). This was pretty ordinary, not particularly tasty. Pretty pricey for a plate of vegetables, too. 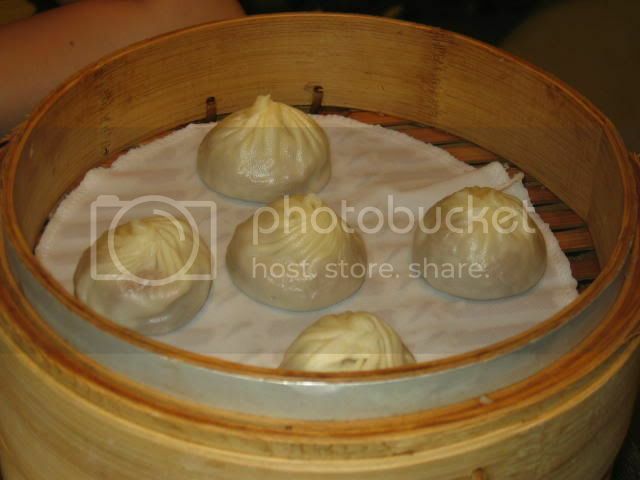 Of course, what everybody comes here for - the xiao long bao. A large basket of 10 costs $8.50 and a small basket of 5 costs $4.80. I can't be entirely sure, but I think the standard of the xiao long bao has gone down somewhat. The dumplings aren't as full and pregnant as I remember them to be, and for some reason they get cold really quickly. 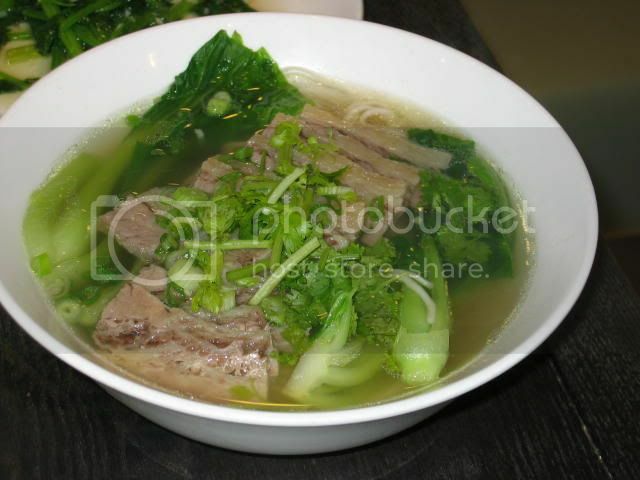 Still, it can't be denied that they're very well-made, and that the meat and broth filling are very tasty. We also had a bowl of clear beef noodles ($10), somewhat resembling Crystal Jade's la mian. The noodles were rather bland, strangely, but I suspect the soup used was chicken-based, as I didn't taste any beef essence in it. The beef pieces looked more like pork than beef, but were fairly yummy and tender. According to Michele, yam is dessert, so we ate these steamed yam dumplings ($4.60) last. They were quite delectably sweet, but would probably have been better had we eaten them hot. Service here is very chop-chop, as you might expect, given the hectic pace of turnover. Thankfully they're very adequately staffed, so you won't have a situation in which you're looking around like a turkey trying to attract a waiter's attention. Don't expect a quiet dinner, as you'll be surrounded by fellow diners, but at least there won't be any screaming babies - the speed with which tables are expected to be vacated means this is not a very baby-friendly environment. Overall: Good for a quick but light meal before a movie, but may be too expensive/limited for a truly filling dinner.